April showers bring May flowers, and filling out the FAFSA puts money in your pocket for college. 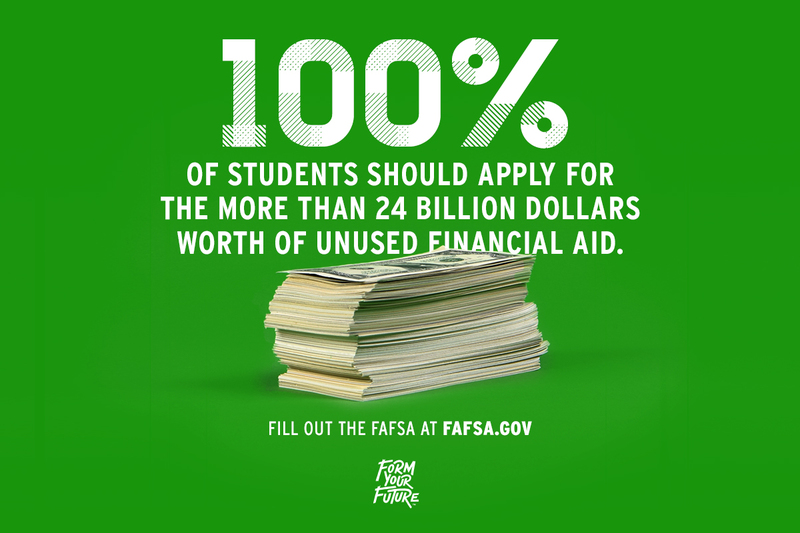 Visit FAFSA.gov to get started. Spring is here, which means FAFSA season is almost over! Don't delay, fill out the FAFSA today! Visit FAFSA.gov to get started on your application. Happy National Pig Day! Pigs may not fly, but you’re going to soar when you get money for college with the FAFSA, apply today: FAFSA.gov. 85% chance of receiving money for college? Shut your pie hole! This Pi Day, visit FAFSA.gov to apply for the FAFSA. The FAFSA awards scholarship money to students who need it. Don't delay, go to FAFSA.gov and fill it out! You have an 85% chance for college financial aid, just by filling out the FAFSA...what are you waiting for? Check out FAFSA.gov to get started! Not filling out the FAFSA is like fumbling the ball at the 2 yard line. WHAT ARE YOU DOING?! Seniors, fill out the FAFSA to qualify for college financial aid, go to FAFSA.gov for more.